Wait, who really does that? Summertime with children generally means changes in schedules, disruptions in routines and a surplus of free time. And for families with children on the spectrum, these kind of changes can create new daily challenges. But, it doesn’t have to be that way. 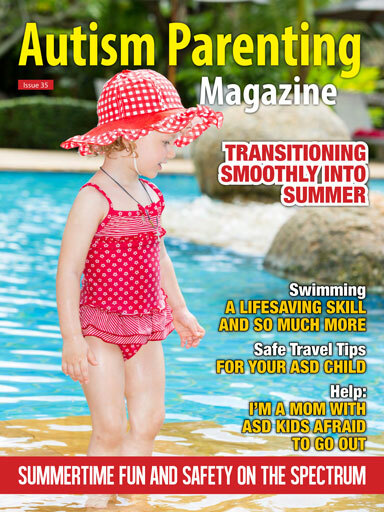 This month we are proud to offer a collection of summer-themed articles from doctors, autism specialists as well as fellow parents to help guide your family on new ways to enjoy summer break. It’s time for summer fun and safety on the spectrum. First, we are thrilled to feature the advice of Dr. Esther Hess, developmental psychologist and executive director of Center for the Developing Mind. In her piece, Top 5 Ways to Transition Smoothly into Summer, Dr. Hess shares how to create a transitioning plan that offers stability and certainty for youngsters with special needs during the lazy days of summer. With the changes in everyday schedules also comes the opportunity for new anxieties and the possibility of new safety risks. Alison Schmeer shares with us some transitional tools that can help ASD children make that transition to summer schedules and activities in Tips for Making the Adjustment to Summer. And since much of summer is spent outdoors, special attention has been paid in the article to keeping your child protected to include pedestrian, bicycle, and water safety. While every child with autism is different and has varying needs, there are many activities you and your family can modify this summer so everyone is included. From heading to the playground together, hiking or gardening as a family to doing arts and crafts with friends, there are so many opportunities to grow. Maintaining daily activities not only brings families together — it keeps everyone healthy. That’s why we are especially excited to share Eric Chessen’s piece, Summertime Fitness Fun — The Actually Usable Guide to a Summer of Physical Activity. An exercise physiologist with an extensive clinical and educational background in Applied Behavior Analysis, Eric explains the importance of ensuring a child on the spectrum has the opportunity to participate in physical activities along with advice on managing expectations and providing time for open-ended activities. He also includes specific go-to activities for developing the general strength and stability that are necessary for everyone. One activity families can enjoy together this summer is swimming. In the article, Swimming—A Lifesaving Skill and So Much More, Tammy Anderson-Lee and Cathy Ball provide tips to help parents of children on the spectrum reduce the risk of drowning as well as appreciate the therapeutic and physical benefits of learning to swim. Authors of the book Swimming with Autism, Lee and Ball also include a network of swim schools committed to providing access and quality instruction for those with autism. In his article Making Waves: Surfers for Autism, sports writer Cash Lambert introduces readers to the amazing Fuentes family who volunteers for Surfers for Autism with their ASD son Lucas, an enthusiastic participant. Each year the not-for-profit group, founded by Don Ryan and a handful of other people in 2008, introduces children on the spectrum to the exhilarating and therapeutic sport of surfing. It’s sure to inspire. Summer also provides new opportunities for families to come together. We are happy to share with you a personal narrative written by Carissa Garabedian, the mother of a 12-year-old son on the spectrum. In Top 10 Tips For Preventing Neurotypical Siblings From Getting Lost In The Shuffle, Carissa shares tips on things families can do to help “typical” siblings not feel lost. A special addition: The boy’s two sisters included their touching thoughts on growing up with a sibling on the spectrum. Dealing with autism challenges can become an isolating experience for some families. Be sure to take time this summer to reach out to and connect with other families affected by autism. You may find the personal support and guidance you need right in your own community. Or maybe you are at the point where you can share your own expertise with other families in search of advice. Be sure to check out Kimberlee McCafferty’s article, Top 10 Ways to Reach Out to the Autism Community, as the former educator and mom on two sons with autism shares ways to connect. With summer often comes day trips and outings. Be sure to read Applied Behavior Analyst Sarah Kupferschmidt’s piece, Top 5 Tips for Keeping Your ASD Child Safe on Outings as she shares her summer excursion advice. It will surely help you plan an enjoyable day while keeping security in mind. We are also thrilled to begin featuring special webinars created by Southeast Psych in Charlotte, NC. This month, we will hear from Dr. Jonathan Feather, clinical psychologist, who will share how Aspie issues can impact married couples and ways to improve relationships. Be sure to tune in to the webinar. Here’s to a safe, healthy and happy summer for everyone! Aspie’s and Marriage – Making it Work by Jonathan Feather, Psy. D.